The first step is to create the dough. Sounds intimidating, but it’s really not. I did everything in the bowl of an electric mixer fitted with the paddle attachment. I dissolve the sugar and yeast in warm water for about 5 minutes or until it becomes a bit foamy. The softened vegan margarine, flour and salt are added in just until it comes together. If it’s too sticky, add just enough extra flour until it pulls away from the side. 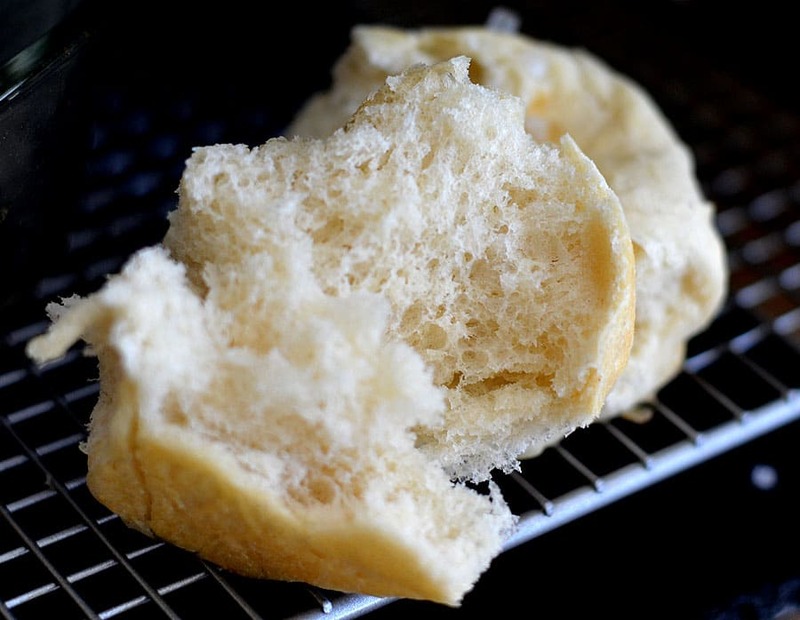 On a very lightly floured surface, knead the dough until smooth. About 3 minutes. Place it in to a bowl, cover and place in a warm (not hot) area of your kitchen to rise for about 20 minutes. 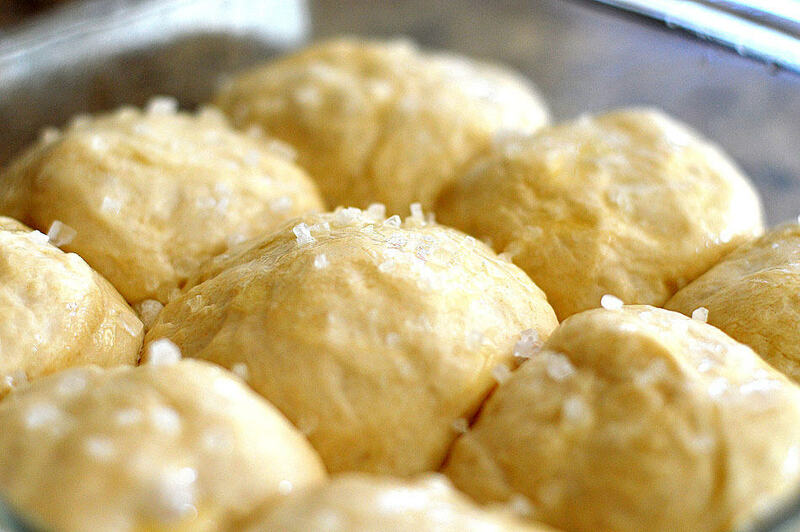 After 15 minutes, lightly punch down the dough and divide into 9 even pieces and roll them into smooth balls. Arrange into a pan prepared with a small amount cooking spray. Leave room between them for rising while the oven is preheating. About 15 minutes or until doubled. Brush with vegan margarine and sprinkle with sea salt. Bake for 12-15 minutes or until just golden. Do not over bake. I had to tear one open for you. 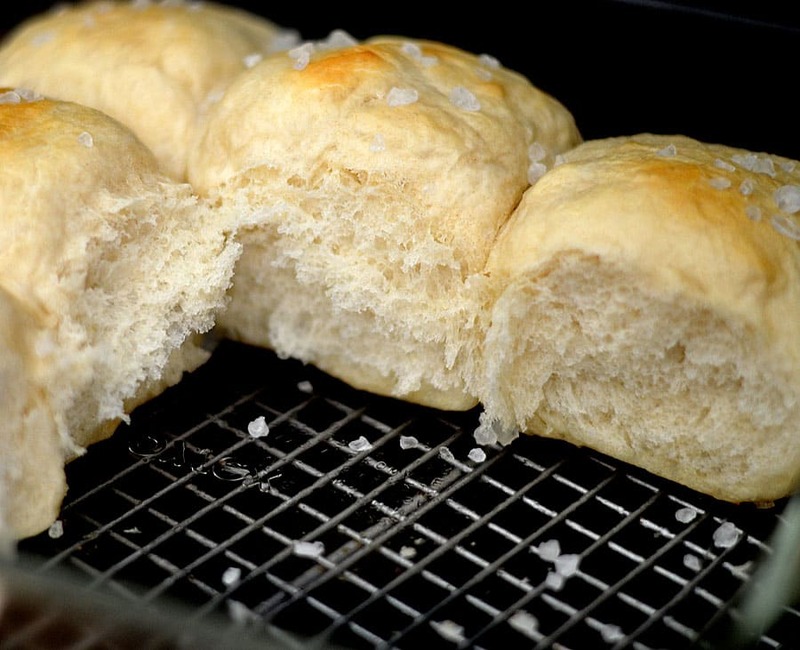 Rolls like these generally take a lot of time, but these are tender and soft and delicious. The exterior is a bit firmer and the interior is just Heavenly soft and pillow-y. Perfect every time and ready in under an hour. If you don’t have coarse sea salt, you can use table salt but don’t skip it. It really brings these rolls to life! In the bowl of an electric mixer, add the yeast, sugar and warm water. Be sure the water is not too hot or too cold or the yeast will not bloom. Once the yeast is foamy (about 5 minutes), add the vegan margarine, salt and flour. Mix until just combined. Do not over beat! If the dough is too sticky, add just a bit more flour (but not too much). Add some flour to your surface and knead the dough until smooth, about 3 minutes or so. Be sure not to incorporate too much additional flour. Let rise for 20 minutes, covered in a warm place. After 20 minutes, lightly punch down the dough and divide into 9 equal portions and roll into smooth balls. Place into a pan sprayed with cooking spray, cover and allow to rise for 15-20 minutes. 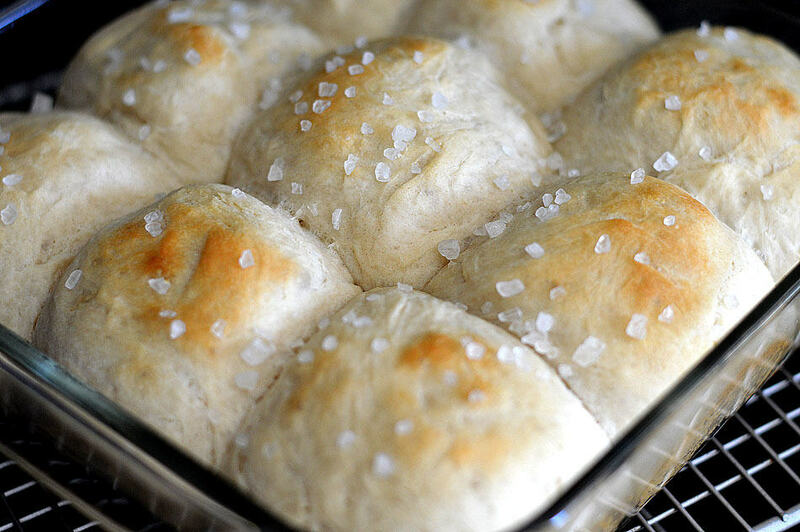 Once risen, brush with melted butter and sprinkle with sea salt. Preheat oven to 400 degrees and bake for 12-15 minutes, or until just golden on top. Don't over bake. Brush with additional melted vegan margarine, if desired. The less flour you have to incorporate after mixing the better. Adding too much additional flour will make them a bit tougher. Do you think these would work with a combination whole wheat and oat flour? Hi Laurie, here’s my thinking on that. Whole wheat is much heavier than white flour and oat flour much lighter. If you were able to work out a good ration between the two, it just might work. But unfortunately, I can’t honestly tell you what the ratio would be. 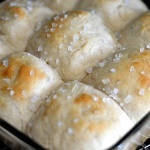 These rolls are so light and airy, I think whole wheat might weigh them down. It might take some experimentation, but it’s certainly possible. I am sorry I couldn’t be of more help on this one. I’m planning to make them for Christmas dinner next week. Thanks for the recipe!